Until now I had only met two other food and wine bloggers. A back yard late summer barbecue, hosting Paul and Stefania Romero of Stefania wines, at the home of Mark & Pam Jahnke, gave me the opportunity to meet F Scott & Zelda, who publish NJ Foodies. Making an appearance at this same event were John and Lisa Howard-Fusco creators of the very informative, John & Lisa Are Eating in South Jersey. Last night, that total of known bloggers climbed to six as John & Lisa arranged a dinner at West Side Gravy for several fellow bloggers. 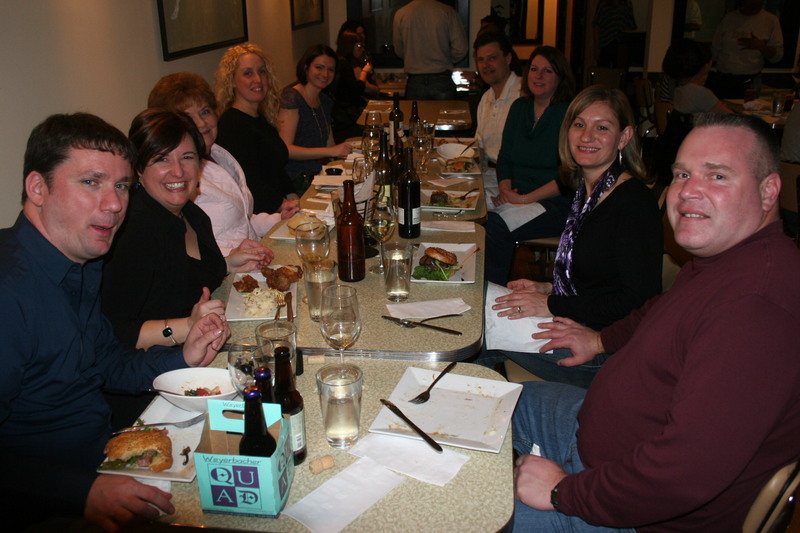 My wife, Kathy, and I joined John & Lisa, Colleen (JerzEATS), Lisa (Jersey Girl Cooks), Jenn (NJEpicurean), and Wendy ( La PhemmePhoodie). Lisa was with her husband, John (making a pair of Lisa/Johns at the table), and Jenn was accompanied by her husband, Matt. Mark and Pam could not join us, but they stopped by the table as they were celebrating Pam’s mom’s birthday in Chef Alex Capasso’s next door restaurant, Blackbird. Mark generously dropped off a nice bottle of the 2006 Stefania , Haut Tubee. Before I get to the wine and food let me say that the company was first-class. It’s not always the easiest thing in the world to sit down to dinner with a large group where few know each other but the conversation was easy and it was great fun to learn about each and every one of our companions for the evening. A special thanks to all of you for making the night a great deal of fun. There were other wines present but it’s too difficult (for me, anyway) to recall all of them but, Kathy and I shared the 2008 Mauritson, Dry Creek Valley, Zinfandel. It took awhile for this one to open up and reveal good pepper and fruit flavors but it couldn’t hold a candle to the “Rockpile” offering, also produced by Mauritson. 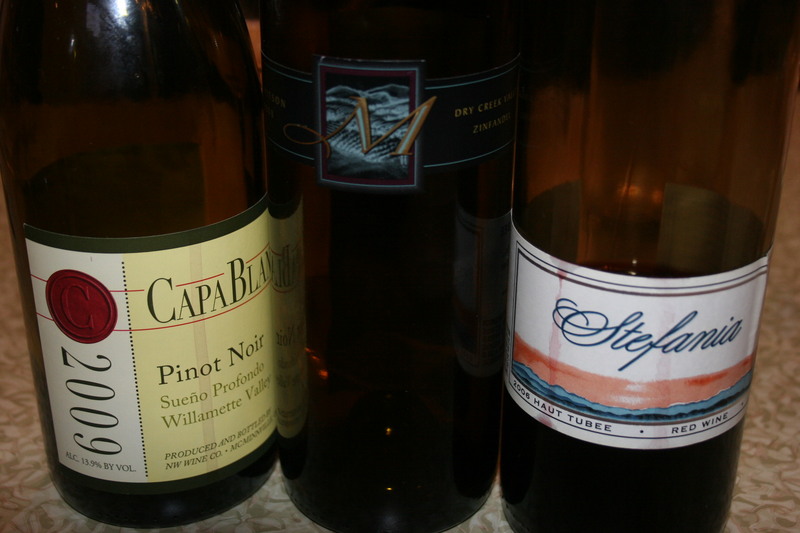 Our other wine was a 2009 Capa Blanca, Suena Profondo, Pinot Noir, Williamette Valley, OR. This one took some time too, but became much more enjoyable as the evening progressed and the dark cherry and spice flavors became more apparent. Our server, Troy, wasn’t big on smiles, but he was certainly efficient and with his team of assistants provided excellent and attentive service throughout the evening. Large tables are probably difficult and he remained focused and made sure we had extra wine glasses, Thanks, Troy! We started out by ordering double dishes of four different starters. This proved to be a good decision and just enough food to satisfy the 10 of us. 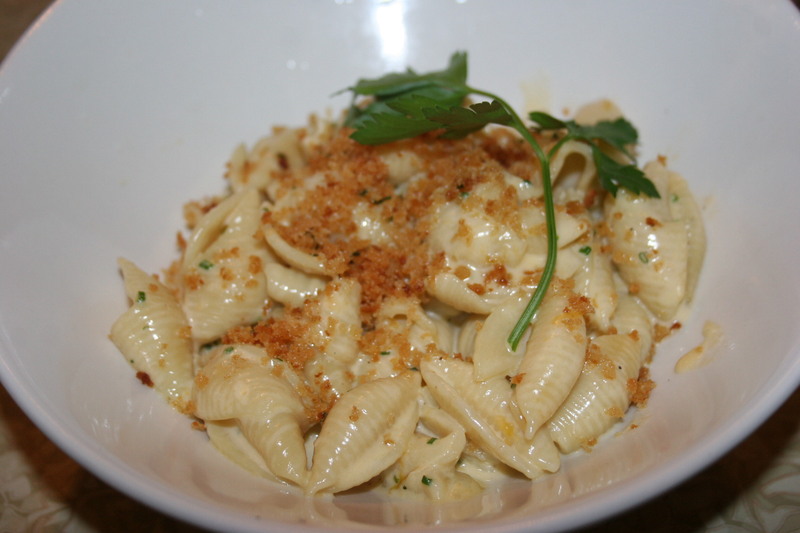 The first item was the West Side Gravy Mac n Cheese, baby shell pasta, cheddar, gruyere, fontina cheeses and herb spices. This one is a tasty dish but I have to say that several other places I have dined have done an even better job with the mac n cheese preparation. 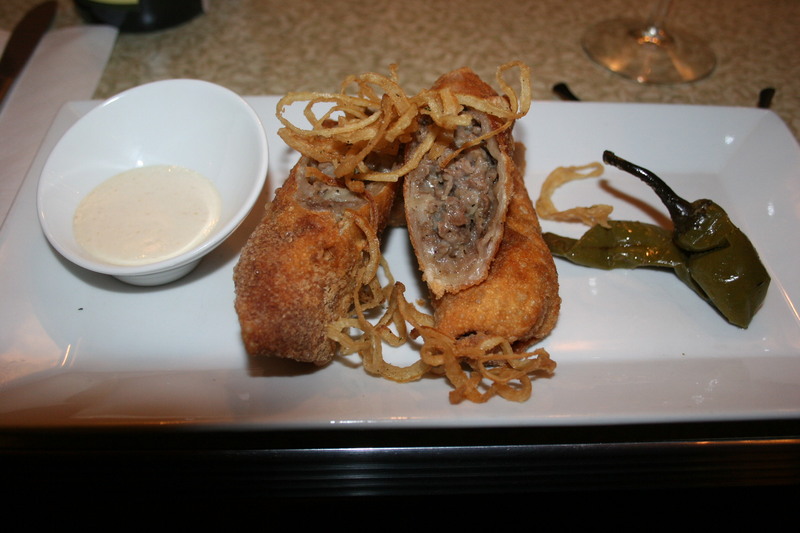 Next came the Cheese Steak Egg Rolls and these were a real crowd pleaser. Shredded beef, fried onions, sharp cheddar, long hots and horseradish sauce. Can you spell Mmmmmmm?? Fish Tacos were our third item. 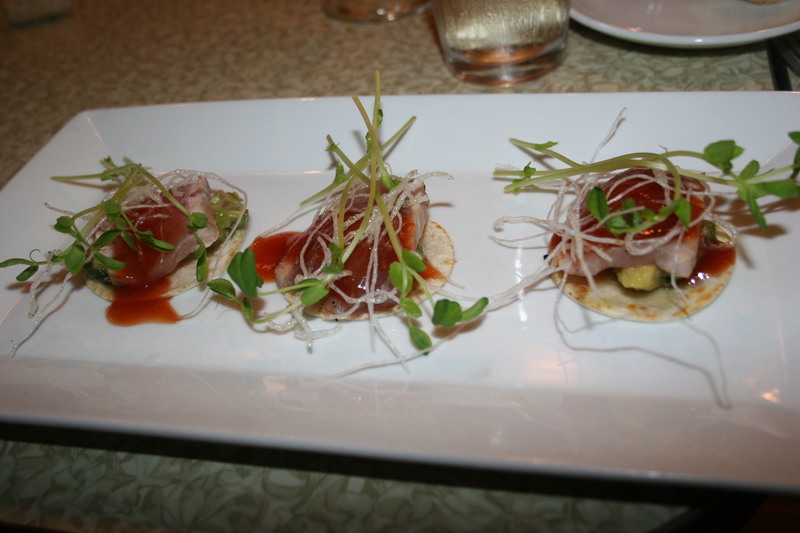 I passed on these but the group seemed to really like the ahi tuna, avocado salad, sweet chili sauce on flour tortillas. They disappeared quickly. Our final appetizer isn’t pictured but it was the West Side Gravy Fries with Pinot Noir sauce. Folks rave about these fries but in the world of great fries these are middle of the road although the sauce is a novel treat. As the evening progressed and the conversation grew more interesting, it was time for some real comfort food. Both Kathy and I chose items from the evening “specials”. 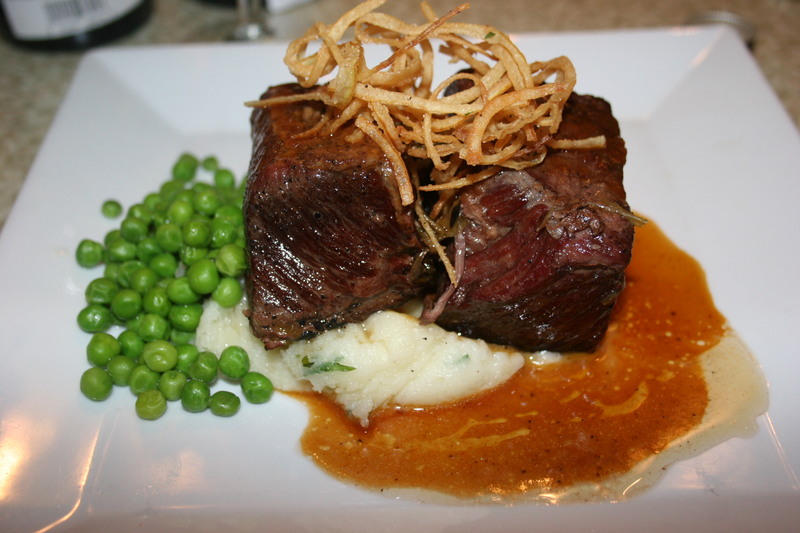 I had the Pot Roast with mashed potatoes and peas. The meat was cooked nicely and shredded with the slightest fork pull. In fairness, I am always a little disappointed when I order pot roast. It just never seems to be full of the flavors I am expecting. I’m going to blame this one on myself. It all very good but not great. 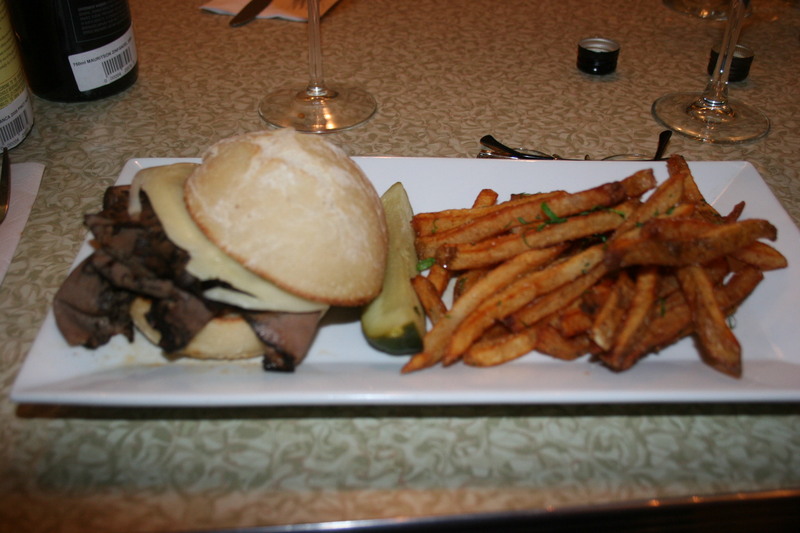 Kathy had the Roast Beef and Provolone Sandwich with house fries. She wasn’t crazy about her choice and even gave me half of the sandwich. I totally agreed. This was not a good sandwich, dry, and lacking flavor. The roll even seemed harder than it should have been. 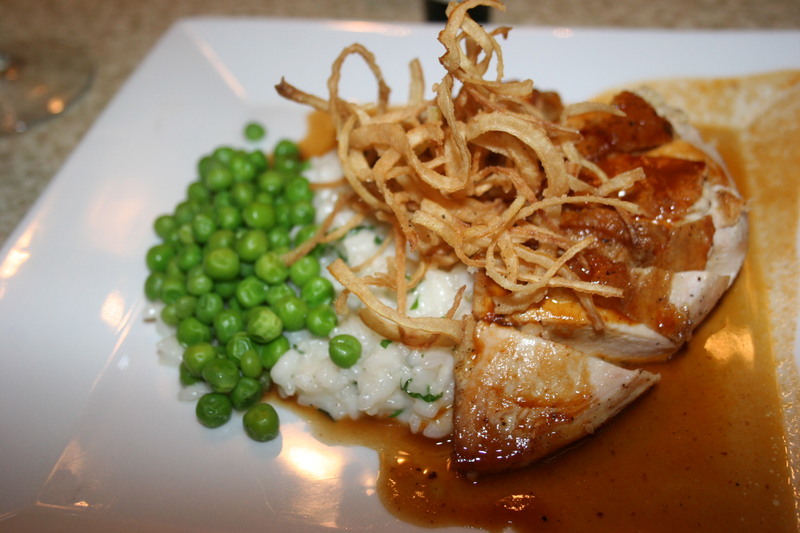 Chicken and Rice, pan roasted breast of free range chicken, seasonal veggies and creamy parmesan risotto. 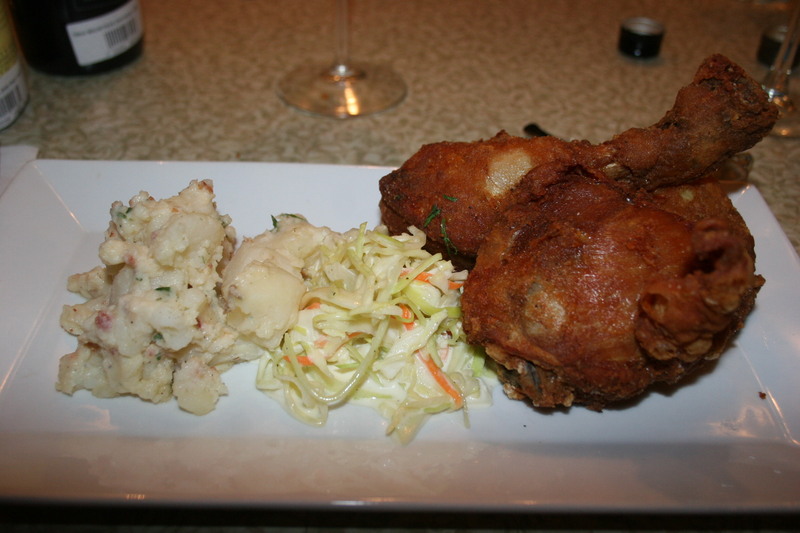 Buttermilk Fried Chicken, with smoked bacon dressing and house made cole slaw. This one looked very nice. 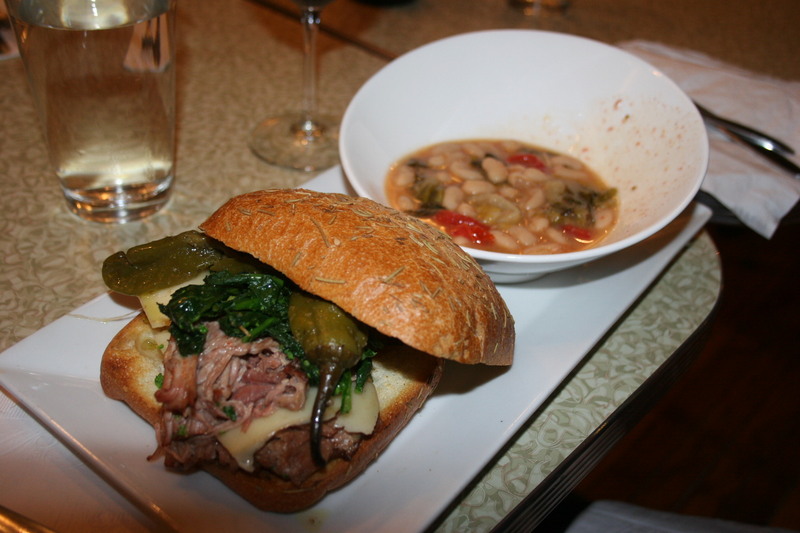 Pork and Beans, braised pork shoulder, broccoli rabe, long hots and sharp provolone on Rosemary bread, with side of Tuscan white bean, tomato and escarole ragout. 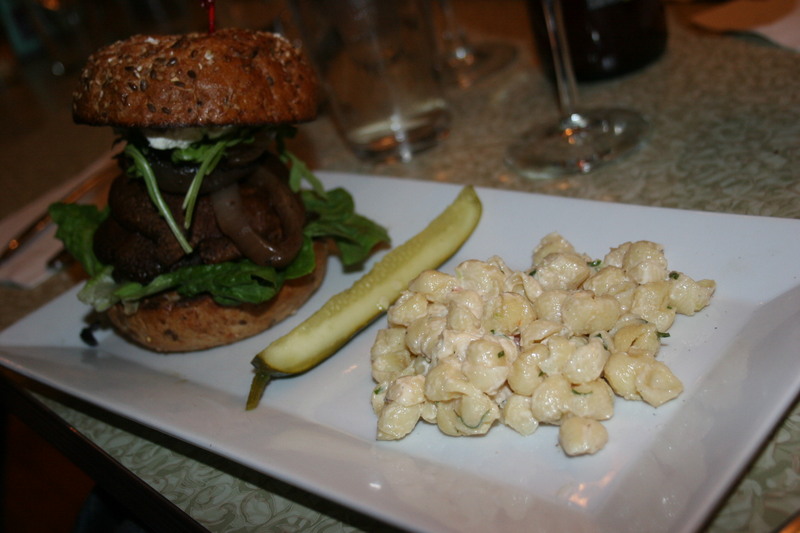 Mushroom Sandwich, Grilled Portobello, baby arugula, grilled onion, lettuce, marinated tomato served on a seven grain bun with a side of macaroni salad. 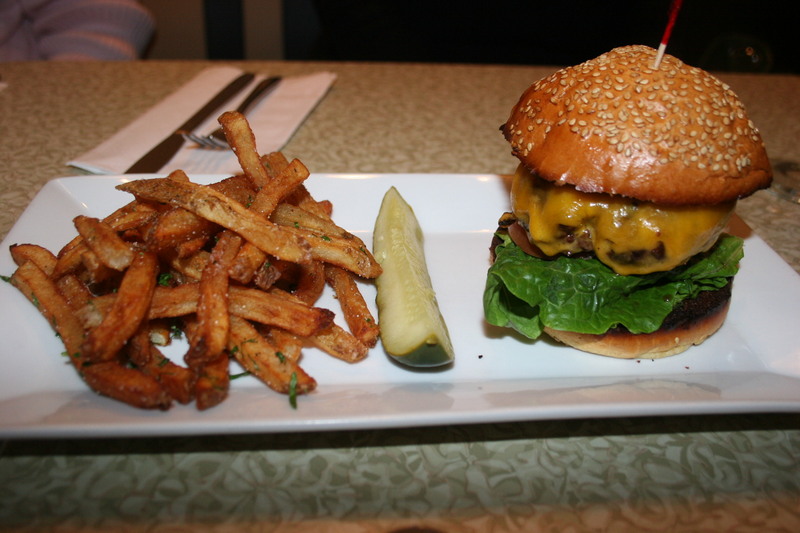 Burger and Fries, half pound of Angus beef, sesame seed brioche bun, cheddar, fried onions, tomato, lettuce and hand cut fries. I’m going to have to try this one next time as the burger looked very good. What better ending to an evening of comfort food amongst comfortable people than some nice desserts. 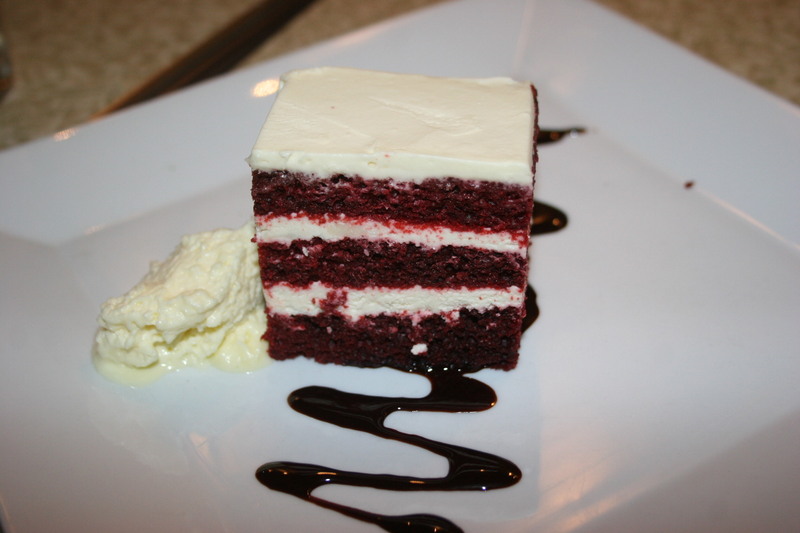 Kathy and I split the Red Velvet Cake which wasn’t on the actual menu but Wendy had been here last week and asked if it was available. It was and it was very tasty. 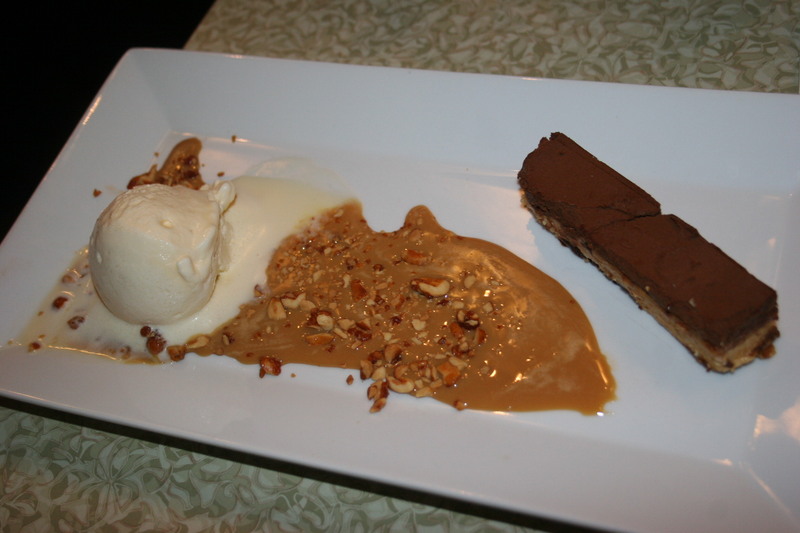 I noticed a few of our dinner companions devouring this one, the West Side “Snickers”, chocolate, peanuts, caramel and nougat with vanilla ice cream and dulce de leche. This was a true dessert winner. One of the really nice things about eating at West Side Gravy is that you don’t need to arrange bank financing prior to dining here. The prices are very reasonable. The food is good but it just might be that my expectations must be too high. Chef Capasso’s Blackbird is one of the best dining spots in all of New Jersey and now it’s located in the next room from West Side Gravy. I realize comfort food is a different style from fine dining but there are just too many misses on the menu. Thanks to all of our new blogging friends for a most enjoyable evening.